My new piece on inequality.org summarizes a shocking new report recently released by UCLA and Duke University researchers. 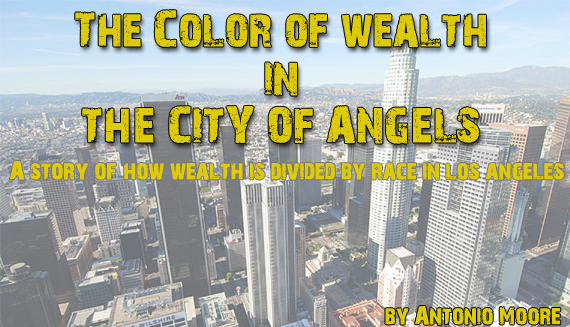 Excerpt: “The Color of Wealth in Los Angeles”, is the first of its kind to analyze ethnic subgroups, showing differences which are often overlooked in the analyses of Federal Reserve data on wealth… The report shows the median U.S.-born black family in Los Angeles, has just 1 percent of the wealth holdings of the city’s median white family. Mexican families roughly parallel black families in their low level of wealth holdings. In other words, for every dollar the median Los Angeles white family holds, the median U.S.-born black or Mexican family only has one cent. 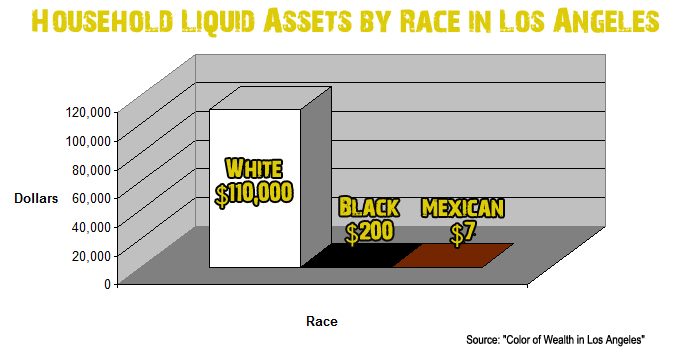 Focusing in on liquid assets makes the wealth disparity even more drastic. The median white family in Los Angeles has a net worth of $330,000, with nearly $110,000 of that in liquid assets. This contrasts with the $4,000 net worth — and $200 in liquid assets — held by the median U.S.-born black household. The median Mexican family in L.A. only has $3,500 in net worth — and a mere $7 in liquid assets. In other words, a median white family in LA has 550 times the liquid assets of a median black family in the city, and over 15,000 times more than a median Mexican family. The other startling data in the research was the vast wealth gap between new immigrant African families, and U.S. born black families. The median net worth for a immigrant African family was found to be $72,000, while the median net worth for a U.S. born black family, as stated above was $4,000. Per the study this disparity is largely due to the fact that the most new immigrant Africans are professionals and arrive with this wealth, while their U.S. born counterparts are saddled with a legacy of disenfranchisement from slavery to Jim Crow and beyond.